Labor markets have traditionally been regarded as the product of a demand and supply of labor.2 In Varieties of Capitalism: The Institutional Foundations of Comparative Advantage, political economists Peter A. Hall and David Soskice put forth two types of economies whose variant organization and structures lead them to experience distinct hiring incentives, which can impact the configuration of a country's labor market leading to gendered hiring practices. On the one hand, there are Liberal Market Economies (LMEs), which are free market economies "characterized by a relatively decentralized system of industrial relations. "3 LMEs' decentralization and lack of government-regulated unionization give them the flexibility "to move their resources around in search of higher returns, … to acquire switchable assets, such as general skills. "4 In LMEs, the lack of specialization and of strong collective bargaining allows for the hiring of women because a potential break in their career for child rearing can be easily managed by seeking other readily available workers and jobs as needed. Coordinated Market Economies (CMEs), on the other hand, "rely on formal institutions to regulate the market and coordinate the interaction of firms. "5 In this type of economy, there is a strong government regulation of markets and policies bolster high unionization. Bound by unions and a need to develop industry-specific skills that are developed over time, CMEs are incentivized to provide job security and invest in human capital that will become more valuable in time. However, investing in highly specialized workers disincentivizes CMEs from hiring women due to the perception that women are more likely to interrupt their jobs and thus, affect efficiency in production. Given the different modes of production, LMEs are expected to have higher Female Labor Force Participation (FLFP) than CMEs due to the latter's propensity to statistical discrimination and hiring rigidity against women. This expectation is supported by the data as visible in Figure 1, which reveals that four of the five countries with the highest FLFP rates are LMEs. However, the data also reveals that there is room for variation in FLFP within CMEs, notably with Sweden making the top five, which directly contradicts CME disincentives to hire women. The question is then: why are there disparities in FLFP amongst CMEs, when, in theory, states with CMEs should be equally affected by statistical discrimination and incentives against hiring women? I will argue that the way the welfare state is structured is one important endogenous facet of that can influence FLFP. The main premise of this essay is that Germany's status as a Conservative welfare regime and Sweden's status as a Social Democratic welfare regime determine whether the state upholds the male-breadwinner model or an egalitarian contract between men and women, respectively. A critical analysis of Child Care Policies in light of Gøsta Esping-Andersen's typology will be used to illustrate the differences in welfare regime types that can affect FLFP. One of the main goals of this paper is to be able to draw meaningful conclusions about the way the Conservative and Social Democratic welfare regimes organize the social contract between men and women. Germany and Sweden's status as the quintessential Conservative and Social Democratic Welfare Regimes, respectively, allows for a comparison with these broader implications. Additionally, similarities across production and labor market organizations such as CMEs but differences in outcomes allows for a connection to be drawn between the welfare structures and these disparities. 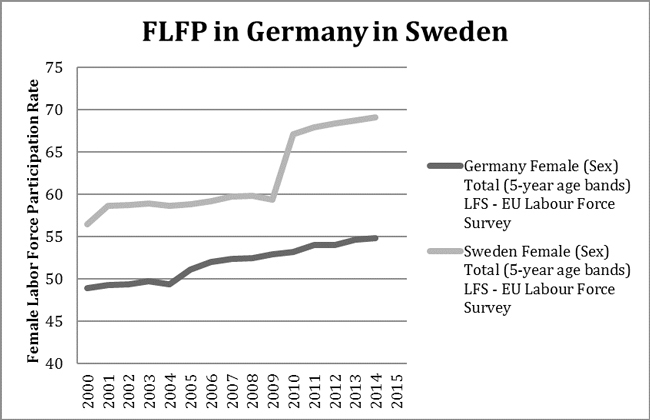 I chose Child Care Policy because it is a policy area where Germany and Sweden operate in fundamentally different ways, likely as a result of their welfare regime structure, and also a policy whether there are strong implications for FLFP. First, I will define the Conservative Welfare Regime and Social Democratic Welfare Regime and how their defining characteristics shape their respective ideal social contract between men and women. Secondly, I will provide a detailed description and analysis of Sweden and Germany's stance in three aspects of Child Care policy: public spending priorities, the implementation of specific measures that either foment or discourage FLFP, and statements by elected officials. This three-part examination of quantitative and qualitative data will allow for a comprehensive view of the policy area revealing the two governments' interest in upholding different social contracts between men and women. Thirdly, I will evaluate the ways in which German policy has shifted in recent years under the push for gender equality and the implications this has for the Conservative gender contract. In conclusion, I will offer a consideration of the implications these different social contracts may have in the realm of gender equality. In The Three Worlds of Welfare Capitalism, Gøsta Esping-Andersen argues that there are three distinct types of welfare regimes: Social Democratic, Liberal and Conservative regimes.6 There are several differences between the Conservative regime and the Social Democratic regime.7 According to Esping-Andersen, a Conservative Welfare State is characterized by its emphasis on the role of the family as the main welfare provider. Scholars concur that "conservative indicates the dominance of the family and corporate interest groups. "8 Consequently, Conservative Welfare regimes have focused on championing the male breadwinner model as a way to guarantee the livelihood of the family unit. Günther Schmid claims that this is a result of the assumption of "basic differences between men and women," resulting in a "clear role division of work: the male ‘breadwinner' and the ‘housewife. '"9 Conversely, the Social Democratic welfare regime is focused on the individual as the center of production. It assumes the diametrical opposite about men and women and in this case, "the gender contract is based on the principle of gender sameness, which means it is assumed that the genders have no basic differences to be considered in social and employment policies. "10 These differences between the two regimes are summarized in Table 1. The different social contracts dictate what each gender is expected to contribute within the family unit. In the case of Germany, it means that the conservative model would theoretically expect women to be domestic caretakers and men to be financial providers, while in Sweden's case, people of both genders would be expected to be productive members of society and a part of the workforce. Now I will consider whether Sweden and Germany exemplify these social contracts in the policies they have employed. At first sight, both Germany and Sweden appear to have a robust interest in supporting the family unit. Both states allocate more than the OECD average of 2.55% of GDP towards family benefits.11 However, Sweden and Germany allocate funding towards different kinds of family benefits. 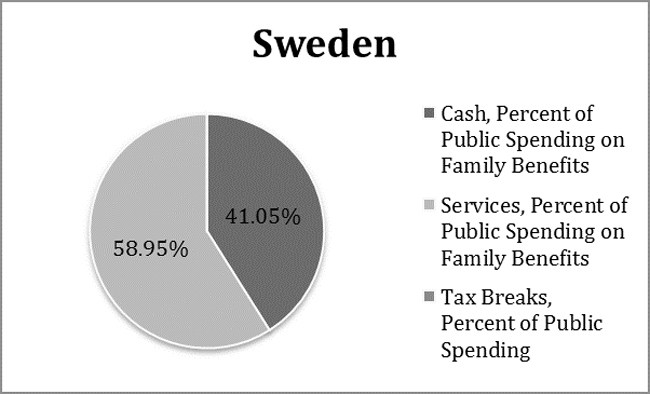 While Sweden's public spending is divided solely between cash and services, Germany's public spending is allocated almost evenly three ways between tax breaks, cash benefits, and services, as pictured in Figures 2 and 3 in the appendix. Germany's choice to allocate almost a third of their spending on family benefits to joint tax breaks for married couples is significant in that it strongly reflects the Conservative Welfare Regime's interest in upholding the male breadwinner model. Tax breaks given to families that engage in ‘income splitting,' where there is one high-earning spouse and one low-earning spouse "gives a disadvantage to dual-earner families with two somewhat equal wages. "12 By choosing to provide joint tax breaks instead of enforcing individual tax breaks, Germany "discourages part-time workers," which are overwhelmingly women, relegating them to the domestic sphere. In comparison, instead of providing families with tax breaks, Sweden spends almost two-thirds of their funds on the direct provision of childcare services. This choice strongly reflects the Social Democratic regimes' focus on an egalitarian social contract by ensuring that families have an incentive to place their children in public childcare and thereby, encouraging a dual-earner household. By not giving families the choice to receive money in exchange for childcare services, it prevents a dynamic where women are encouraged to care for children as their contribution to the household. The allocation of funds towards joint tax breaks is but one of the many ways in which the German government has discouraged women from entering the labor market. When faced with labor shortages, the German government "made strong efforts to meet its labour shortage by the recruitment of foreign ‘guest-workers' rather than by integrating married women into the labour market. "13 Additionally, they chose to incentivize women to take on mini-jobs, which was " a very particular German institution that provides incentives to keep monthly earnings below 450 Euro. "14 Mini Jobs were first implemented in the 1960s "in order to encourage housewives to take up at least a small part-time job, and to solve the problem of labour shortages in several industries. "15 These two choices reveal the Conservative Welfare regime's strong interest in enforcing the male breadwinner model and ensuring that German women stay in the home and care for the children. This is not to suggest that the policy is negative, as many women might have welcomed mini jobs as a way to be productive and fulfill their motherly duties. However, the policy does reveal a government interest in keeping women in the home to in lieu of having them work full-time. For Germany, women's role as caretakers took precedence over their employment in the labor market. Up until the 1960s, Sweden, too, had a variation of the male breadwinner model in place, "displaying more egalitarian features than the German gender regime which can perhaps be traced back to a strong agrarian tradition and late industrialization. "16 However, by contrast, Katrin Bennhold points out that when faced with the same problems of labor shortage "Sweden…made a strategic decision to get more women into the work force in the booming 1960s. "17 The decision to encourage women to work reflects the Social Democratic regimes' interest in fomenting an egalitarian social contract between men and women as a primary focus. The Swedish preferences of either integrating or omitting women from the workforce were corresponded by either the provision of childcare or availability of part-time jobs. In the face of economic depression and low birth rates, an influential report by Hinnefors "painted a threatening picture of looming economic stagnation or recession… and noted that the huge reserve of married women who could be mobilized. "18 The message was heeded by many parts of society, including women who were strong advocates for childcare and against the hiring of foreign workers in the 1960s, laying the groundwork for future reform. Consequently, Sweden employed widespread family policy reforms in the 1970s, which resulted in the implementation of universal preschools. The National Pre-School Act was implemented in 1975, making local authorities accountable for providing public childcare. Daycare was guaranteed for any child between the ages of one and five and enrollment increased throughout the decades. By the year 2005, daycares enrolled 90% of children between one and five.19 This emphasis on the provision of public childcare demonstrated a commitment to both the promotion of "child-bearing while also allowing for individual liberty, especially for women. "20 Inherent in these policies is an emphasis on mothers' ability to be at liberty to decide. In contrast, the political conversation in Germany was governed by conservative experts who "unremittingly warned … ‘institutional care' would have serious and detrimental effects on its psychological and moral development," focusing their arguments on the well being of children.21 In line with that point of view, German feminists and women's organizations were not concerned with obtaining child care services as they "considered it best if mothers took care of their own children. "22 Thus, it becomes clear that the German government's interest in expanding part-time employment was largely accommodating to many German women who sought economic independence but also to maintain their traditional role as housewife within the male-breadwinner social contract. In the 1960s, German working mothers were often characterized as Rabenmütter, which directly translates into ‘uncaring mother' and refers to mothers who "selfishly abandon their toddlers to pursue careers," or as Heimchen am Herd, which is a phrase that represents a mother happy to stay home with the children.23 This kind of language was not only commonplace at the community levels but also utilized government campaigns where "the family ministry attacked working mothers as greedy ‘double earners' pursuing egoistic interests rather than fulfilling their family duties. "24 Inherent in these terms is a conservative moral judgment of German mothers that strongly indicts those that would opt to put their children in government provided care. On the other hand, the rhetoric surrounding childcare in Sweden is different in that instead of emphasizing that a mother's care is the best thing for a child, there is a stronger focus on the many benefits a child receives from attending public daycare. Additionally, and perhaps interestingly, instead of placing an emphasis on the idea of choice, Swedish politicians stress the importance of the woman's right to work. In an interview with Swedish Ambassador to Korea, Anne Höglund, she expressed the belief that "childcare services of high quality [are] provided to ensure women's right to work" as a means for "economic independence for their decision-making power. "29 Throughout the interview, Höglund places a strong emphasis on the importance of women's competitiveness vis-à-vis men.30 Similarly, in a speech to the United Nations, Minister for Children and the Elderly and Minister for Gender Equality Åsa Regnér said that "access to affordable child care services…[has] been essential for women's and men's participation in the labour market. "31 The two women's constant allusion to "life balance of both women and men" and an "equal distribution between women and men" in all social areas reflects the Social Democratic welfare regimes' interest in upholding an egalitarian social contract between men and women. Throughout the past decade, Germany has implemented several policies with the potential to shift German policy away from the traditional male-breadwinner social contract between men and women. One example is the 1992 implementation of a policy that guaranteed full-time child-care for children of at least 3 years. Subsequently, on August 1st, 2013, German progressives introduced a bill to guarantee children at least 1 year old with government subsidized care.32 This policy signals a move towards a more Social Democratic conception of the social contract between men and women by seeking to afford women that want to work full-time the ability to do so. However, while the policy has been instituted, the expected outcomes have not been met. A report conducted by the Ministry for Families, Seniors, Women and Youth found that "there are child care facilities for 27.6% of the children under 3"33 due to a lack of infrastructure and personnel.34 The expressed interest in providing childcare has not been met with actual resources; thus far, they are unfulfilled words that have not allowed women to choose full time employment in lieu of their full or part-time child-rearing responsibilities. Bremberg, Sven. 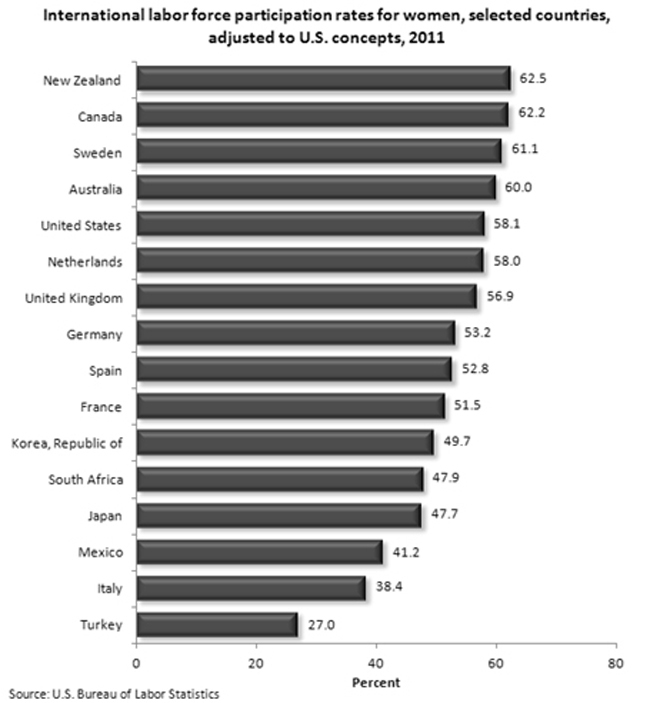 "A Perfect 10: Why Sweden Comes out on Top in Early Child Development Programming." Paediatrics & Child Health 14, no. 10 (December 2009): 677–80. Bureau of Labor Statistics, U.S. Department of Labor, The Economics Daily, International labor force participation rates for women, 2011 on the Internet at http://www.bls.gov/opub/ted/2012/ted_20120907.htm (visited April 05, 2016). Esping-Andersen, Gøsta. The Three Worlds of Welfare Capitalism. Princeton, N.J: Princeton University Press, 1990.
International Labour Office (ILO). 2013. ILOSTAT Database (Geneva). Naumann, Ingela K. "Child Care and Feminism in West Germany and Sweden in the 1960s and 1970s." Journal of European Social Policy 15, no. 1 (February 1, 2005): 47–63. doi:10.1177/0958928705049162. Schmid, Gunther. Full Employment in Europe: Managing Labour Market Transitions and Risks. Edward Elgar Publishing, 2008. Weinkopf, Claudia. "Women's Employment in Germany." Revue de l'OFCE, no. 133 (March 1, 2014): 189–214. Analia Cuevas-Ferreras is a senior at Yale University majoring in Political Science with an emphasis on International Relations. Her current research examines the rise and influence of the far right in Europe. "Labour Market Definition," The Economic Times, accessed April 1, 2016, http://economictimes.indiatimes.com/definition/labour-market. Peter A. Hall and Soskice, eds., "An Introduction to Varieties of Capitalism," in Varieties of Capitalism (Oxford University Press), 1–68, accessed March 31, 2016, http://www.people.fas.harvard.edu/~phall/VofCIntro.pdf. Edmund Heery and Mike Noon, A Dictionary of Human Resource Management, 2nd ed. (Oxford University Press, 2008), http://www.oxfordreference.com/view/10.1093/acref/9780199298761.001.0001/acref-9780199298761. Gøsta Esping-Andersen, The Three Worlds of Welfare Capitalism (Princeton, N.J: Princeton University Press, 1990). For the purposes of this essay, I will only describe Conservative and Social Democratic regimes as they relate to the social contract between the family and the social contract between men and women. Gunther Schmid, Full Employment in Europe: Managing Labour Market Transitions and Risks (Edward Elgar Publishing, 2008). "PF1.1: Public Spending on Family Benefits" (OECD, September 19, 2014), http://www.oecd.org/els/soc/PF1_1_Public_spending_on_family_benefits_Oct2013.pdf. 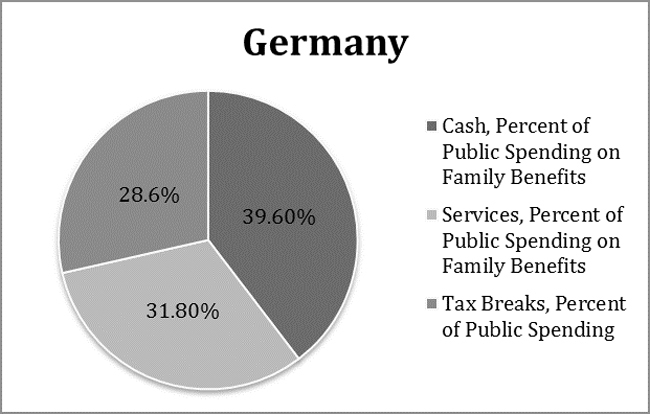 "Child and Family Tax Benefits in Germany," accessed April 3, 2016, http://www.tulane.edu/~rouxbee/soci626/germany/_pbaliga/childfamilytaxbenefits.htm. Ingela K. Naumann, "Child Care and Feminism in West Germany and Sweden in the 1960s and 1970s," Journal of European Social Policy 15, no. 1 (February 1, 2005): 47–63, doi:10.1177/0958928705049162. Claudia Weinkopf, "Women's Employment in Germany," Revue de l'OFCE, no. 133 (March 1, 2014): 189–214. Naumann, "Child Care and Feminism in West Germany and Sweden in the 1960s and 1970s". Katrin Bennhold, "In Sweden, Men Can Have It All," The New York Times, June 9, 2010, http://www.nytimes.com/2010/06/10/world/europe/10iht-sweden.html. Governments of all political hues in Sweden have legislated to give women equal rights at work — and men equal rights at home. Sven Bremberg, "A Perfect 10: Why Sweden Comes out on Top in Early Child Development Programming," Paediatrics & Child Health 14, no. 10 (December 2009): 677– 80.Crisis in the Population Question, Alva and Gunnar Myrdal outlined many of the features that were later assessed by the United Nations Children's Fund. Three aspects may have affected the implementation of Myrdal's ideas. First, the Social Democratic Party has been in power for 85% of the time since 1932. They often had to form coalitions with other parties that supported a nonpartisan stance. Second, according to evidence from the World Values Survey, Swedes are more individualistic than people in any of the other 64 societies included in that study. The State is expected to create social conditions on equal terms for individuals to realize their own goals. Finally, schools and other social services are managed by 290 semi-independent municipalities. Thus, reforms can be tested in a few municipalities before others follow suit". Ibid.Crisis in the Population Question, Alva and Gunnar Myrdal outlined many of the features that were later assessed by the United Nations Children's Fund. Three aspects may have affected the implementation of Myrdal's ideas. First, the Social Democratic Party has been in power for 85% of the time since 1932. They often had to form coalitions with other parties that supported a nonpartisan stance. Second, according to evidence from the World Values Survey, Swedes are more individualistic than people in any of the other 64 societies included in that study. The State is expected to create social conditions on equal terms for individuals to realize their own goals. Finally, schools and other social services are managed by 290 semi-independent municipalities. Thus, reforms can be tested in a few municipalities before others follow suit. "Fighting over the Kinder," The Economist, August 17, 2013, http://www.economist.com/news/europe/21583676-cr-ches-trump-euro-and-much-else-german-election-campaign-fightingoverkinder. "Pay to Stay at Home," The Economist, May 5, 2012, http://www.economist.com/node/21554245. Sara Malm, "Germany to Pay Stay-at-Home Parents Extra Benefits for Keeping Toddlers out of State Daycare," Dailymail, accessed April 4, 2016, http://www.dailymail.co.uk/news/article-2190259/Germany-pay-stay-home-parents-extra-benefits-keeping-toddlers-state-daycare.html. "Pay to Stay at Home". "Interview: Ambassador Anne Höglund of Sweden | SwedenAbroad," accessed April 4, 2016, http://www.swedenabroad.com/en-GB/Embassies/Seoul/Current-affairs/News/InterviewAmbassador-Anne-Hoglund-of-Sweden-Gender-Equality-Needs-No-Arguments---The-WomensNews-sys/. "Speech by Minister Åsa Regnér at Commission on the Status of Women 2016," Text, Regeringskansliet, (March 16, 2016), http://www.government.se/speeches/2016/03/speech-byasaregner-at-commission-on-the-status-of-women-2016/. Weinkopf, "Women's Employment in Germany". Fiederike Heine and Speigel, "Germany Promises Daycare for All Parents," ABC News, August 4, 2013, http://abcnews.go.com/International/place-germany-promises-daycareparents/story?id=19847116. "Germany: A Modern Family Policy for a Compatible Partnership of Family and Career and for Economically Stable Families European Platform for Investing in Children (EPIC) European Union" (European Platform for Investing in Children (EPIC) European Union), accessed March 30, 2016, http://europa.eu/epic/countries/germany/index_en.htm. Bennhold, "In Sweden, Men Can Have It All. "governments of all political hues in Sweden have legislated to give women equal rights at work — and men equal rights at home." http://www.nytimes.com/2010/06/10/world/europe/10iht-sweden. Katinka Barysch, "Why Do so Few German Mothers Go back to Work?," World Economic Forum, accessed April 4, 2016, https://www.weforum.org/agenda/2014/04/german-womenfeelneed-choose-kids-career. Monique Kremer, How Welfare States Care : Culture, Gender and Parenting in Europe (Amsterdam: Amsterdam University Press, 2007), http://dare.uva.nl/aup/nl/record/216794. Figure 1. Source: U.S. Bureau of Labor Statistics. Figure 2. Source: OECD Family Database – PF1.1 Public Spending on Family Benefits. Figure 3. Source: OECD Family Database – PF1.1 Public Spending on Family Benefits. Figure 4. Source: ILOSTAT European Labor Force Survey.